Wood laser cut brooch Prickly pear cactus brooch - light green and peach. 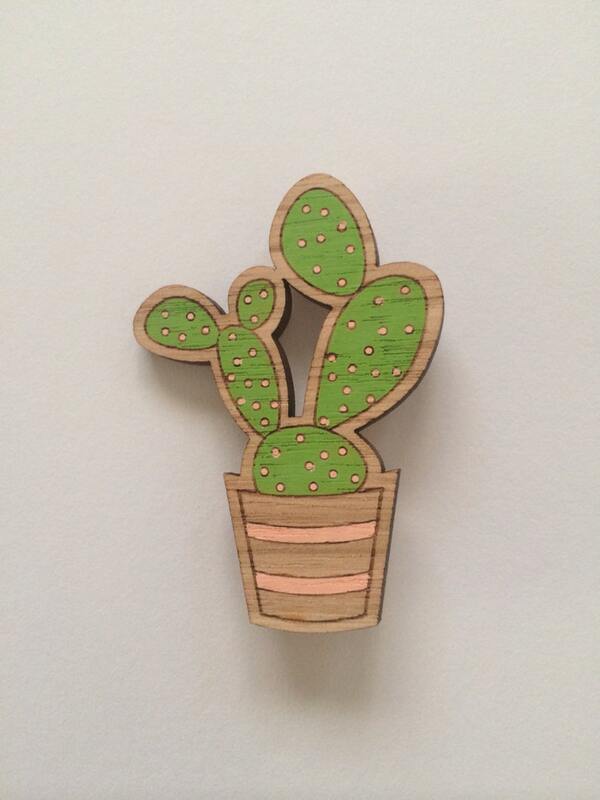 This potted cactus will look great on your shirt, dress or cardigan or even as a pin on your bag. The brooch is made from laser cut wood and is an original design by Jon and Jules Sutton. Convo us about colours for the border if you wish (for an extra $5). We will happily try and customise for you in anyway we can. Made from – 4mm thick, laser cut wood, Acid-free spray matte varnish (2 coats) and brooch back. Please note that the item in the picture is a sample. Every piece is an original one and therefore there may be differences in the direction and effect of the wood grain. We are based in Australia and are willing to post internationally. Lovely item. Very happy customer. Love this! It's so cute. Sconnie and Jam were so lovely to deal with too! Sconnie and Jam accepts PayPal and Etsy Direct Checkout. We will send out your order within 3 - 5 business days from when your payment has cleared. Our prices of shipping include standard postage cost and packaging. We do our best to ensure that your item is packed in a way that is the most inexpensive for you but also most protective for your item. If you would like your item to be packaged in a different way, we will do our best to accommodate this but it may incur extra charges. We do not refund because of change of mind or postage issues once it's left our studio. If there is something not right with your product, please let us know and we will work things out. We will try our best to make sure you are happy with your Sconnie and Jam product. After payment has been received, we will ship items within 3- 7 business days. This means, it'll leave our studio within 3 - 7 business days after payment has cleared. It doesn't mean that it'll take 3 - 7 business days to arrive to you. We cannot guarantee delivery dates. Even if you request an Australian "Express Post" upgrade, we can only guarantee that we will post by that service. Once ANY package has left us, we cannot be held responsible for what happens to the package during transit or upon receipt. We will do everything in our power to make sure that things will arrive to the customer and in a timely fashion but have no control over what happens after the item has been shipped. In keeping postage costs low, we send via standard post which means no insurance, no tracking number and no signature required. If you require any upgrade on postage to add insurance, tracking number or signature on delivery, please contact us and we will provide you with a quote. This can get quite expensive (especially if outside of Australia) and all extra costs will need to be paid by the customer. Our postage quotes are based on the pricing structure by Australia Post. We do not have details of individual countries customs regulations or taxes and therefore will not be held responsible for these fees/taxes/amounts and are payable by the receiver. If you believe there might be taxes issued for your order, we suggest you make enquiries with your Customs department or postal service before ordering to avoid any unwanted surprises. We send all of our order from Brisbane, Australia. It can take up to a week to arrive domestically and 2-3 weeks internationally. In most cases, items will be received in a shorter time frame than this but, once again, cannot be guaranteed. As previously stated, we are not responsible for mail once it has left us. If your package does not turn up within the expected timeframe, please contact us and we will do everything we can to follow up with it but if sent by regular post without tracking, it's nearly impossible to get any information from Australia Post. We always allow for 3 - 4 weeks for delivery before we deem the package as lost.